This post is a summary of a user group presentation in Fremont on Jan 30th, 2007, hosted by Hurricane Electric, a Managed Services web host. 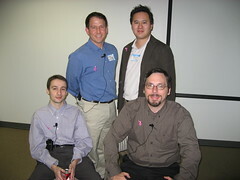 I’ve graciously accepted Bess Ho’s offer to be the moderator for the panel, we have Sean Ness Co-Founder at STIRR.net & Business Development Manager at Institute for the Future, Dmitriy Kruglyak CEO & Community Steward, Trusted.MD Network, and Harry McCracken the Vice President/Editor in Chief, PC WORLD. This is a unique event, unlike other conferences that focus on current technology. This is glimpse into the future of web, technology, information, and how society will mix with it. There were over 100 people there, I polled the audience and many were software engineers, developers as the primary bunch. Met some interesting and intelligent folks, great crowd. Update 2: Colleague Irina and Eddie check out this small mobile device that exists today called the OQO, pretty interesting demo, and a nod to what lies ahead. How will we Interact with the Internet of the Future? A Demo with the MyVu Visor. One of the interesting things about working at PodTech is how all kinds of interesting folks come into the office as well as interesting and unique products. A few weeks ago, I showed you Chris Coulter’s Archos screen, here’s an interesting tool. 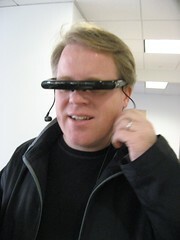 Thanks to Sam Levin who brought in his MyVu personal media player to PodTech. Interesting adaptation for mobile devices. He was playing video media from his iPod, the MyVu has a hardware device that attaches to the Video iPod. The field of vision for the screen wasn’t too large, while not a ‘theater style’ it certainly let you do other things, such as moving about or pretending to listen to someone boring. I’m sure you could plug this to a PC, kick back in a lounger and do your work. It was an interesting experience, I’d love to play with this $350 toy on a plane ride. We’re starting to integrate video into the internet faster and faster, and IPTV could make a break for it in the next year or two. I predict in the next 5-10 years that input devices to the web (today we use the keyboard and mouse) will slowly start to disappear and new technologies will figure out how to determine text from slight movements of your fingers, or watching your mouth move. I also expect that output devices (we currently use monitors and screens) will dissolve into glasses, transparent walls, and even holographic technology. I’m hoping a future technology will be able to embed an invisible screen (for a HUD) in prescription type glasses. Say good bye boring meeting! The internet (the name may change to something like the network or cloud) will become amorphous and ubiquitous. How will we interact with the internet in the future? Will we continue to have visible devices? Will they become so small they dissipate and are barely noticable? Will the input and output devices be everywhere? Will we still have cubicle hell? My friends that work at Yahoo and I agree that Yahoo is more of a Media company than anything else, so this announcement comes at very little surprise. Yahoo has launched some interesting community platforms that aggregate content from a variety of their properties. Check out their Nintendo Wii platform site, it: Pulls in videos, social networking from existing yahoo profiles, there’s also message boards, FAQs, Content, ratings, trackbacks (a form of a memetracker) ecommerce modules, Q&A with Yahoo Answers, all with the feel of the branded experience of Nintendo. There’s quite a few social aspects to this platform, where interaction with other real individuals is part of the core concept. Now that Yahoo is doing the job of Nintendo’s Web team, what will those web professionals do? Oh yeah, play more video games. Since there is going to be 100 more branded websites launched in the consumer space, perhaps other web developers at those brands can take some time off. Is this web development outsourcing a threat to web teams at consumer branded corporations? Did the Nintendo Marketing department bypass the Nintendo Web Director to make this play happen? To many, Jennifer McClure is one of those special people in the PR industry, she’s shared with me her passion for Public Relations, Social Media, and has helped to found a resource for our industry called the Society for New Communications. As well as the research arm called Society for New Communications Research. They’re having a conference in Vegas soon, co hosted with Ragan PR, I recommend you attend if given the opportunity. I went last year, it was held here in Palo Alto and I had an enlightening experiences. A few months ago Jennifer and I spoke at Ragan PR in Chicago, I took notes of her session. Jennifer Jones has interviewed Jennifer McClure on Marketing Voices. I recommend you listen in, here’s what you’ll hear an interesting discussion around: Building a Corporate Culture for Social Media, the discussion revolved around the topics of how Corporate cultures cultivate different deployments of Social Media, communicating within and outside of your company, and which industries are better at listening than others. If you’re reading this in a feedreader, please access the player on the PodTech site. You may not see the embedded file below. This podcast was not paid for by Jennifer McClure or her associations. If you’d like to share this video on your blog, forum, or website, please click the orange share button and grab the code and embed. Charlene Li sent me copies of her recently published Calculating The ROI Of Blogging from Forrester. It also included a PDF A Case Study A Look At The ROI Of General Motors’ FastLane Blog. Given my interest in the topic, she knew I’d give a fair review, and has given me permission to discuss it without giving the document away to others. Previously, I’ve been very involved in this discussion, earlier this month I stated that corporations still require justification for business blogging (I’ve been talking to quite a few folks in corporations lately) in fact I even stated that you can’t measure the ROI of blogging until you can measure the value of other marketing activities. It’s not perfect however, as it can’t fully measure (and nothing can) the holistic goodwill and emotional impact business blogging can have to individuals. There are still some folks that throw caution into the wind, be sure to read KD Paine’s reservations and comments on scope of cost. I’ve had debates on ROI for blogging many, many times, and often while on stage. I recommend this document to corporate folks that need to deploy Business Blogging (like I did at Hitachi) only if you’re at an impasse to prove to upper management. For many corporations, $375 is a small amount of money to pay for the report. Already successfully deployed a social media program at your company, and it’s already deemed a success. Management is pleased with you, and you’re already obtaining more budget. If you’re already able to prove the success of your programs (without having to compare against costs) then you may not need this document, just continue forward. Even if you don’t need to bring to the table an ROI metric, you should still be measuring. Also, this way, if you have a change in management’s opinions, you can apply the measurement over the cost, and spend some time to obtain an ROI metric. PodTech’s clients are asking for this, so it’s toward the top of my interest levels. I’ve been very interested in this topic, as I was trying to measure while deploying in my previous corporate role. In my current role as a consultant, many of our clients are asking “what does success look like” and “how do we show this to management”. I’ve also been involved with Factiva and thought leaders from our industry for a roundtable. View all my posts tagged Social Media Measurement. Thank you Charlene for sharing the report with me and letting me provide an unbiased opinion. Excellent work, Forrester has helped to move our industry forward yet again. Last night over dinner, Kristy Wells (who is one of the founders of Social Media Club) and I discussed the usage of the term Social Media. I gave a lot of thought to that term before using it. Before, I was using the phrase Community Marketing as that is really the corporate end result that these tools are doing. The biggest criticisms folks have against Social Media is that Media can’t be social, I first heard that from Dennis. I’ve thought about some other terms such as “Socializing Media”, but that just sounds odd. “Conversational Media” doesn’t work either, as not all of the tools exhibit conversational traits, some have unwritten gestures. To me, the term “new media” is even worse, as how long will any technology or trend be new? Help me come up with some better terms, but please, don’t say “Web 2.0”. Chris Coulter has been giving me his thoughts on this in the back channel, hopefully he’ll jump in here and give his opinion, which is always welcome. If you can come up with a better term, I’ll be happy to change my vernacular, I’m always looking to improve. Update: Loren hates Social Media, but be warned he uses harsh language, and um, well is not wearing much. If you’re ok with that, watch his video. Update 2: I wasn’t clear on my stance in this post. I prefer the term “Social Media” as I’m unaware of a better term to use. There are folks that dislike the term “Social Media”, so this is a post asking those that don’t like it to suggest a better term. If they can convince me, I’ll change my vernacular. Update Feb 22: Doc Searls responded to Brian Solis (but Doc didn’t provide any useful nomenclature to replace Social Media) Scoble is feeling defensive.